Proposed Area 8 on Parkview Slopes (see map below) is intended to be the site for a mixture of 75 homes (an increase of 52 units over the current permitted density of 23 units). The intent is that approximately 1/3 will be cottage-style “micro/eco homes” (750 to 1,150 square feet) suited for small or single-person households with modest needs for space and/or modest incomes. 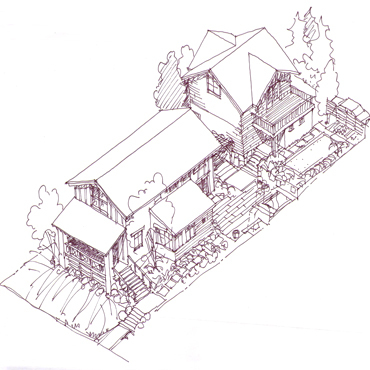 Approximately 2/3 will be a mixture of garden-style homes configured in duplexes, triplexes, or fourplexes. A total of 25 of the homes shall be on non-market, long-term land lease lots. The principle of land lease intends to make home ownership more affordable than comparable fee simple land ownership. The lease will follow a very traditional concept which has been used in many countries in Europe for hundreds of years, and is based on a term of 99 years. The lease payments shall be payable quarterly or semi-annually over the period of the lease. This is different from most of the locally known forms of land leases under which lease payments for the term of the lease are mostly paid up front (which would defeat the purpose of trying to achieve affordability). Equally important, increases in lease payments over the term of the lease shall be based on the cost of living index, NOT increases in the land value. This avoids the most obvious and common drawback of land leases, namely unstable and unpredictable increases in lease payments based on rising property values (as some lease holders in Vancouver have experienced in the past). Homes on lease lots will be owned by lease holders, and can be sold, mortgaged, or left as an inheritance, the same as with homes on fee simple lots.